Saturday 7:00 a.m. – 2:45 p.m. 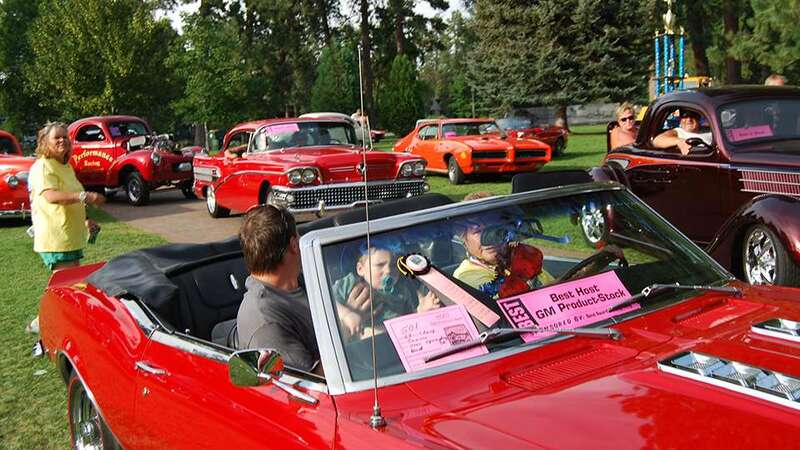 Awards start at 2:00 p.m. Drake Park Show and Shine, DJ Wade Fagen and live music from 11:30 a.m. – 1:30 p.m. Beer garden, food trucks, kids play area, and over 30+ vendors. 2:00 p.m. awards presentation, immediately following will be a drawing for the 1973 Buick Centurion convertible and Auto Clinic donation car, a 1998 Subaru given to a deserving family. Saturday 9:00 a.m., Duane Mayer will be signing autographs at the Wesco booth. Saturday 11:00 a.m., Duane Mayer will be signing autographs at the Napa booth. Saturday 6:00 p.m. – 8:00 p.m., veterans downtown Cruz. Live auction for rides in the Cruz with proceeds benefiting the Veterans! Saturday 8:30 p.m., downtown block party, live music and dancing. Sunday is a free day to explore all that Central Oregon has to offer.